Catch The Intoxicating Teaser Of Amazon Prime Video's Next Prime Original Four More Shots Please! Amazon Prime Video Originals have unveiled the teaser of their next original series ‘Four More Shots Please’. 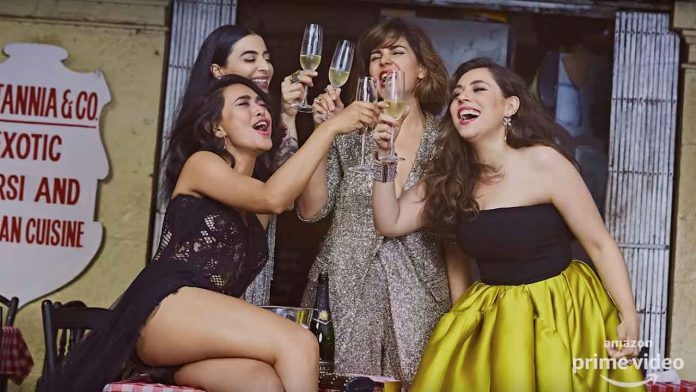 The teaser of Four More Shots Please gives us a sneak peek into the lives of four imperfect women, bound by a beautiful friendship. ‘Four More Shots Please’ follow’s their trysts with the men in their lives, their emotional highs and lows and their personal battles. Written by Devika Bhagat, with dialogues by Ishita Moitra, Four More Shots Please! revolves around the lives of four very different women each fighting their own individual battles and tackling life as it comes. Based in the southern tip of Mumbai, the city that never sleeps, these four friends get together every couple of days to binge talk and get smash drunk at their favorite garage bar, ‘Truck’. It’s the magic of pure, unadulterated and yet sometimes flawed, friendship. Four More Shots Please! is the urban, millennial Indian woman’s gaze, a slice-of-life, brutally realistic portrait of what it is like to be in a country caught in a constant battle between the traditional and modern, to be a thinking woman, to be free in a country caught up in chains and to be honest in a country that thrives on hypocrisy. Previous articleBollywood’s Leading Lady, Deepika Padukone Celebrates Her First Birthday After Marriage!